In the highly competitive world of sports betting and odds making, sportsbooks and bookmakers need any advantage they can get over the competition, and that includes one of the most important aspects of the business - where and how they get their data. Big or small, very few gambling operators can handle the large amount of personnel and resources needed to source the huge amount of scouting data they need to run their operations and satisfy all their users’ varied gaming needs, so they turn to professional live scouting data providers. There are a few trusted big names in the industry, like FeedConstruct, with its many years of successful operation and one of the largest worldwide networks of scouts, but before you choose your sports data partner, here are five things to consider in making your decision. If you can get all your sports data needs covered in one place, do so. Data provision for multiple sports from a single source makes for a more seamless integration and much less hassle than having to deal with different providers and their varied platforms, which means a much more streamlined business operation for you. FeedConstruct currently thoroughly covers 12 major and minor sports- Soccer, Volleyball, Basketball, Ice Hockey, Beach Volleyball, Snow Volleyball, Table Tennis, Futsal, Handball, Badminton, Squash and Sambo. Sports are global, and players are increasingly seeking more (and more varied) event types from all over the world. There are hundreds of worldwide leagues, tournaments and special competitions, and any modern-day sportsbook needs to maximize its offerings to appeal to the broad tastes of today’s players. Online bookmakers have clients with many different origins and interests, and their betting options should reflect that. FeedConstruct covers 6000+ matches monthly in 70+ countries, one of the broadest coverages in the industry. What if you could get more than just accurate and reliable live data from popular sporting events around the globe provided by a team of professional scouts? FeedConstruct goes above and beyond by providing exclusive live video content streamed live or on demand for players and bookmakers. With 11500+ unique live video events streamed per month, FeedConstruct’s live sports video streaming compliments our live scouting data service, in addition to odds suggestion and statistics at no charge, if available. Live scouting data is only as good as its accuracy and speed. In the fast-paced world of sports betting, every millisecond and every ball movement counts. 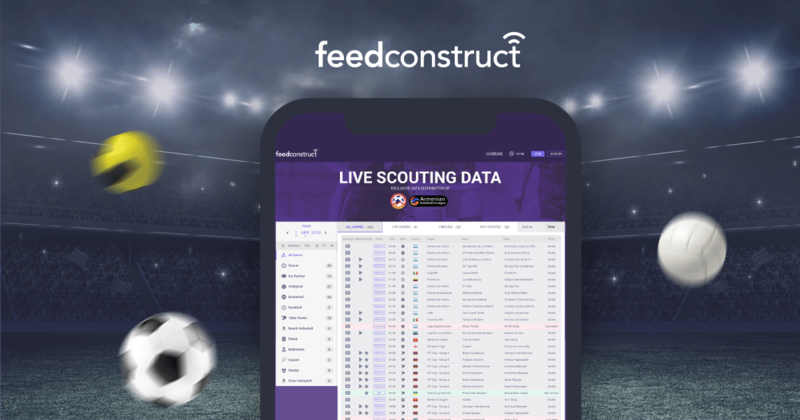 FeedConstruct’s team of 1000+ worldwide scouts deliver real-time stats from sport events in every corner of the globe in under 0.5 second, and instantly relay it to your server. Wherever the coverage comes from, our on-the-ground reporting combined with fast and secure communications guarantees accurate and reliable information, to keep you leaps ahead of the competition. The product is only as good as the support you get with it. FeedConstruct partners with some of the biggest names in the industry to deliver fast and reliable live scouting data to millions of players worldwide, but what sets it even more apart (and will set you even further apart from the rest) is continuous technical and user support throughout the lifespan of the service. Make use of our live monitors, multi-lingual support agents, and quality assurers, and get 24/7 live supportby a dedicated supervisor for every match. Don’t settle for anything less. The right sports data provider can mean the difference between being on the cutting edge and getting cut off the edge. Contact our sales team for a personal demo of FeedConstruct’s industry-leading scouting data service, and experience the difference for yourself.